From Underground Toys. Unleash the mighty power of Lord Vader's lightsaber... to eat your dinner! 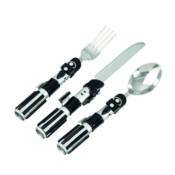 Modeled on the Darth Vader's iconic weapon of choice, this collection of unique utensils takes dining to the dark side! Each item in the set is made of plastic and stainless steel and measures approximately 215-194 x 16.5mm.